“Prototypes” is the title Gironcoli gave his monumental sculptures, which he created in his later body of work from 1977 onwards. Here, he used a term borrowed from the field of technology. A prototype is normally the first model of a new product, with which it can be tested for functionality and design. Gironcoli’s “Prototypes,” however, exhibit not only technological, but also human and amorphous forms. Let’s take a look back to the beginning of the 20th century, the middle of the industrial age, which fundamentally changed people’s work and indeed their lives following the invention of the steam engine that had gone before. During this time, a group of young Italian artists got together and called themselves “Futurists.” In their art and writings they glorified the engine and the rapid locomotion it produced. However, Gironcoli’s creative process is entirely different: His large sculptures are generally composed of many different materials and then coated with a kind of oven spray paint, making the pieces look like cast metal. Another product of different aggregated materials is “The Spirit of Our Time (Mechanical Head)” (1919), by the artist Raoul Hausmann. Hausmann, who belonged to the Dadaists, likewise created the work at the beginning of the 20th century. The Dadaists saw their work as a kind of anti-art that undermined the bourgeois values of art. The basic component of Hausmann’s sculpture is the hand-lathed head of a wigmaker with technical devices screwed into it, including a pull-out travel cup on the top of the head and part of a camera. The forehead is measured by a centimeter ruler and crowned with a piece of cardboard bearing the number 22. With the title “The Spirit of Our Time,” Hausmann is pointing to the fact that the head can be a symbol of the merging of man with the technological achievements of the period. In every age, humanity has to grapple with new technological inventions and their consequences. Since the beginning of time, humans have tried to optimize their skills using tools, and each time period has been defined by the invention of new machines. Before the industrial age, for example, it was the clock mechanism or hydraulic technologies. For many years there was a theory that humans differed from machines only in their ability to think and feel. At present, we are experiencing the increasing digitization of the information age, and it’s from this period the sculptures by artist Lee Bul come from. 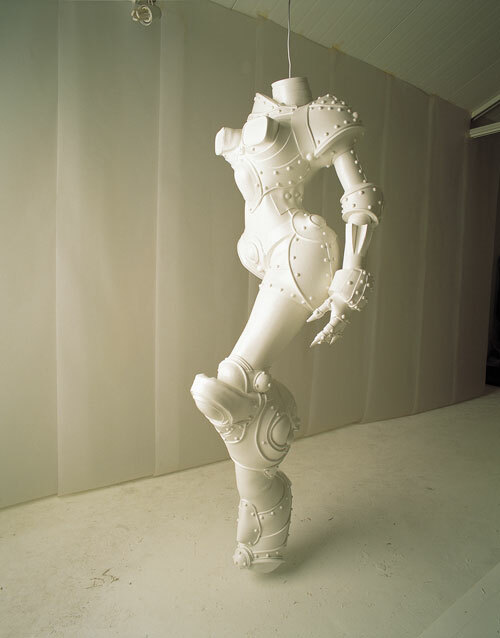 With the title of her series “Cyborgs” (1997–2011), Bul makes it clear that this is not about the depiction of robots, but rather illustrations of people who have been permanently supplemented by machines. In her sculptures, we see tubes leading into the bodies of figures, that thus become hybrid creatures somewhere between machine and human – cyborgs, if you like. They evoke clear associations with the female body; their large breasts and narrow waists are reminiscent of the unnatural beauty ideal of a Barbie doll. At the same time, the bodies remain fragmented with limbs and even heads missing. These three highlights bring us back to Gironcoli, whose sculptures were produced in the transition stage between the industrial and the information age. In his “Prototypes,” the human is neither a motor for locomotion (Boccioni), nor does he merge with technological devices (Hausmann) or computers (Bul). Rather, here the machines appear to be producing little human beings. To a certain extent, creation is turned on its head: The human no longer creates technology but the machine creates a new human. For around 50 years she accompanied Bruno Gironcoli as a wife, fellow artist and friend. Christine Gironcoli about the ups and downs of his artistic career and her life with the known maverick.